When it comes to customer experience, acquisition, retention, experience management, cross-sell and upsell—Teradata can help. We help you deliver relevant, personalized experiences in real-time, influence customers’ journeys to align with your desired business outcomes, and build systems that support the complexity and scale you need today and in future. Teradata delivers a complete customer journey offering with the scalability, performance, and expertise—both domain and industry. We know how to generate the targeted capabilities, deployment speed, and increased business value you need to engage customers with confidence, delivering the right message in real time. 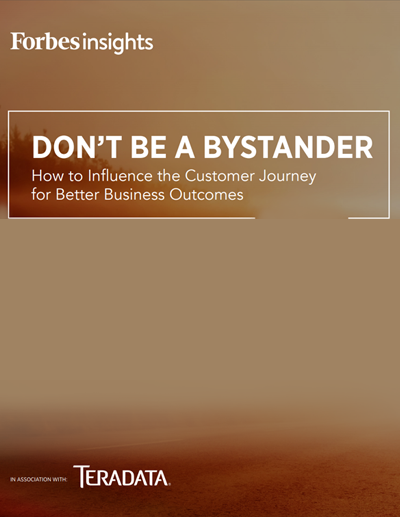 Find out how the Teradata Customer Journey is being applied in a variety of industries. 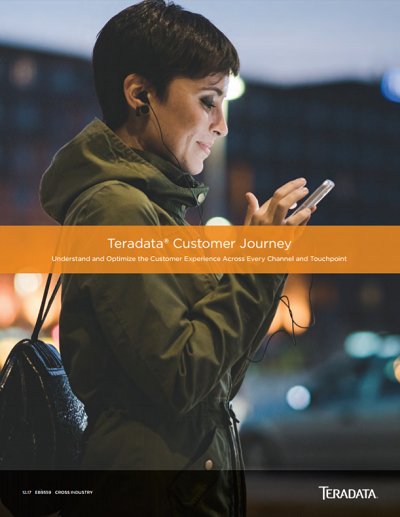 The Teradata Customer Journey takes a three-pronged approach: Connected Data, Connected Analytics, and Connected Interactions. Connected Data pulls together your relevant data for a 360° customer view. We apply the latest analytic capabilities to that data—Connected Analytics—help you understand your customers’ desired, motivations, and intent. Then we automate the fast, efficient deployment of sophisticated contact strategies—Connected Interactions—through any inbound or outbound channel, so you can influence and optimize customer journeys. Aligning offers with the customer journey improves customer experience, and lifts both sales and service productivity. 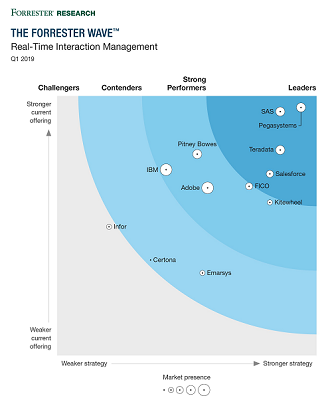 Teradata gives you the tools to manage customer interactions across all touchpoints and channels in real-time, for personalized, contextually relevant offers and communications. Global CPG giant P&G depends on Teradata to follow the customer journey for more than 4.8 billion consumers. We use our breadth and depth of expertise in data integration, advanced analytics, and cross-channel orchestration to create best-in-class customer experiences. Lloyds Banking Group 'crowd funds' initiatives to execute analytic projects that benefit the customer journey. Modern Customers Expect More. We Help You Deliver.